Crouzon syndrome-Craniofacial cochin-The Comprehensive Solution for all Craniofacial Problems. Crouzon syndrome is a genetic condition with features of craniosynostosis (the early closure of skull sutures) and abnormal development of the eye sockets and midface. These conditions occur when there is abnormal fusion between some of the bones of the skull and of the face that does not allow the bones to grow normally, affecting the shape of the head, the appearance of the face and the relationship of the teeth. The features of Crouzon syndrome were first described by the French neurosurgeon Dr. O. Crouzon in 1912. Crouzon syndrome differs from most other craniosynostosis syndromes because it does not involve abnormalities of the hands and feet. However, cervical spine abnormalities are fairly common, and a smaller percentage of patients may have subtle elbow, hand, musculoskeletal or internal organ anomalies. Crouzon syndrome is a rare genetic disorder estimated to occur in 1.6 per 100,000 people. About 4.5% of people with craniosynostosis have Crouzon syndrome. The cause of Crouzon syndrome is a genetic change or mutation in one of the fibroblast growth factor receptor (FGFR) genes — FGFR2 on chromosome 10 and FGFR3 on chromosome 4. Some people inherit the Crouzon syndrome gene mutation from a parent. Only one parent needs to have an abnormal gene for the child to inherit the disease. A person with Crouzon syndrome has a 50% chance for each pregnancy of passing this mutation on to the child. For other people, no one else in the family has a diagnosis of Crouzon syndrome and the condition occurred because of a spontaneous change in FGFR2, the gene that causes Crouzon syndrome. Crouzon syndrome is caused by an abnormality in the genes. If both parents are normal, that is showing no sign of the syndrome themselves, this abnormality is the result of a change in the genetic material at the time of conception. The exact cause of this change is not known. If one parent is affected, the abnormal gene is then know to have been contributed by that parent. Does this mean that this can happen again in my family? If both parents are normal, the chances of a second child being born with Crouzon syndrome are extremely small. However, if one parent is affected, the chances that any pregnancy will result in a child with this syndrome is 1 out of 2 (50% risk). For this reason, it is very important that both parents of an affected child be thoroughly examined before any recurrence risks are quoted to them. The facial features of babies with Crouzon syndrome vary widely. Craniosynostosis (the early closing of one or more of the sutures that separate the bony plates of the skull) in Crouzon syndrome most often occurs prior to birth. But it can occur later, during the first two or three years of life. Some babies with Crouzon syndrome are born with an abnormal head shape (tall and narrow from front to back), wide-set prominent eyes (due to shallow eye sockets), small beak-like nose and small midface. 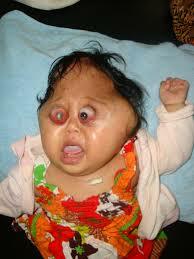 Some babies with Crouzon syndrome develop craniosynostosis after birth so that the head shape changes over time. The eye findings are usually apparent at birth. The eye sockets are positioned further apart and are shallow, so the eyes appear to protrude. The eyes may not align properly so the gaze is outward. Late onset (5 to 10 years old) craniosynostosis has been reported in several children with Crouzon syndrome who suffer from headaches and vision changes with a relatively normal head shape. Other neurological problems include an increased risk to develop hydrocephalus (excess fluid on the brain) (30%) or Chiari malformation (abnormality of the back of the brain). About 97% of people with Crouzon syndrome have normal intelligence.